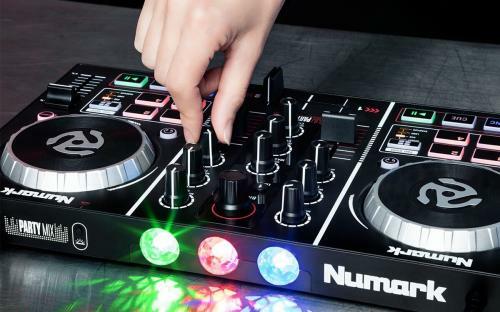 The Numark Party Mix DJ Controller is made specifically for aspiring DJ's. This is a complete controller package including a unit with controllers for two decks with sync and multiple pad modes. Both Virtual DJ LE and Serato DJ Lite software is included, so players can mix their music and customise their performance exactly as they want! Got Questions? See our FAQ Questions section at the bottom of the page. There are eight colour-coded pads with multiple modes, including looping and sampling, as part of the standard DJ feature set that also includes master and cueing audio outputs. The Back-Lit Sync controls make mixing easy and there’s a ¼-inch headphone jack so the DJ can monitor everything that’s happening. Plus, Party Mix has a built-in light show that gives any occasion that perfect party atmosphere. This is a simple plug-and-play controller that everyone will feel comfortable with right away. We have the Lowest Price. Guaranteed. No matter what your skill level you can get any party started with the Party Mix! This is an amazing DJ Controller that connects directly to your laptop and lets you play and mix all of your favourite songs and videos with the included DJ software. Mix, blend and create just the right mood with this 2-channel DJ controller that empowers you to rock the house. Preview your mix in your headphones before you cross-fade the music to your speakers—like a pro! With Party Mix’s built-in light show you will shower the room with beat synchronised colourful light patterns, creating the perfect party atmosphere! You are going to love having all the professional DJ features that come with Party Mix. Each deck is ready with four cue points with readily accessible pads for effects. You can toggle through the Pad Mode and find your auto loop functions and create loops on 8, 4, 2 and 1-bar phrases. You can add instant effects to your music and you can toggle through and find your sampler for access to pre-loaded samples and drums or add your own(4 on each side). Control your EQ with treble, bass, channel gain and master gain to customise your perfect sound. All the tools are right at your fingertips. Party Mix is a snap to use right out of the box, and it has all the deep pro features to keep up with you as your DJ’ing skills grow. The three built-in LED light arrays sync to your mix, flashing from the back of the Party Mix, illuminating your performance. You can leave them on or turn them off, whatever you like. They add a cool dimension to your performance, moving to the beat, setting the perfect party mood. Party Mix includes Virtual DJ LE to make mixing your music, videos, and even Karaoke tracks fun! You have absolute control with Party Mix on how you want to mix, blend, loop add effects and sample. Manage your music using your iTunes playlists, or put together great playlists and create your mixes. The Numark Party Mix includes Virtual DJ LE and Serato DJ Lite. A license code and download link are provided in your numark.com account when you register your product. 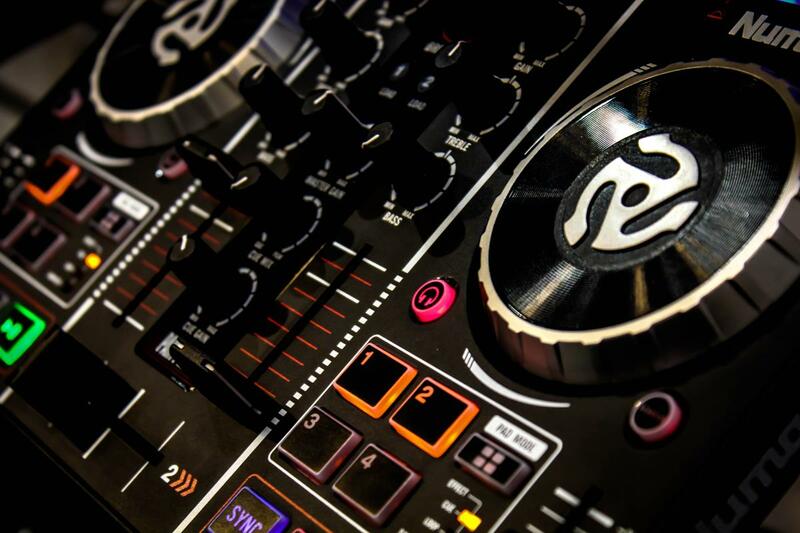 Accessing and activating your free software is as easy as registering your product on the Numark website. Where can I download my free copy of Serato DJ Lite? You can download Serato DJ Lite Here. After you have downloaded Serato DJ Lite, simply plug your Party Mix in for the software to work. You will not have to pay anything extra to use the included Virtual DJ software. A license for Virtual DJ is indeed included with the Party Mix. However, if you forget to activate the software after installing, it will run in a time-limited demo mode, or will ask you to buy a license. Of course! In fact some people prefer scratching with smaller jog wheels. Since the jog wheels are smaller, they have less mass and can move much more quickly and feel more responsive than larger platters to some people. 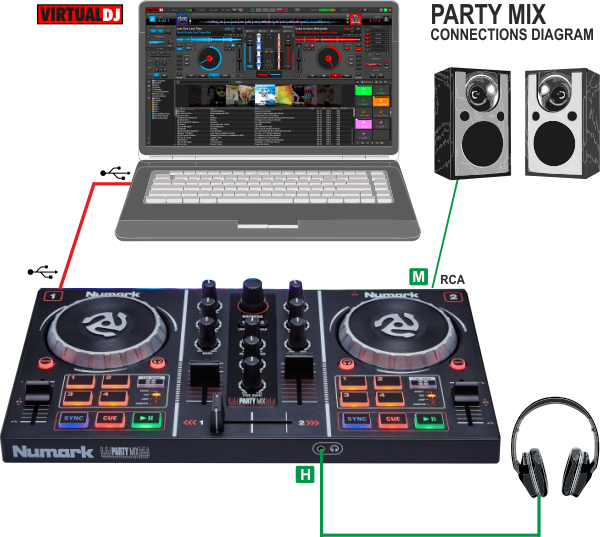 Does the Numark Party Mix work with Traktor or other DJ programs? The Party Mix is made for Serato and Virtual DJ. However, since the Numark Party Mix appears to your computer as a generic MIDI device, it can indeed be custom-mapped to any other DJ application that supports user or developer-created custom mapping. When launching Virtual DJ LE, be sure to select 'Use Soundcard' to auto-setup the Party Mix Hardware, or select Party Mix in the software under Config > Controllers. Very excited son on Christmas morning. Been looking for these for a long time and it didn’t disappoint. Easy to set up and he was making music within 15 minutes. The partymix is a great starter item . Easy to setup with free access to the program needed. My daughter has spent the entire day creating music with no experience with this before . Highly recommend and delivery was fast also !